Lego builder Piterx makes gorgeously detailed Technic replicas of real-life vehicles. The latest is a motorsports legend: The Lancia Stratos, one of the most fearsomely beautiful cars to ever blast down a rally stage. And thanks to dual R/C motors, this Piterx model is as fast and drift-happy as its real-life brethren. Just look at the details. 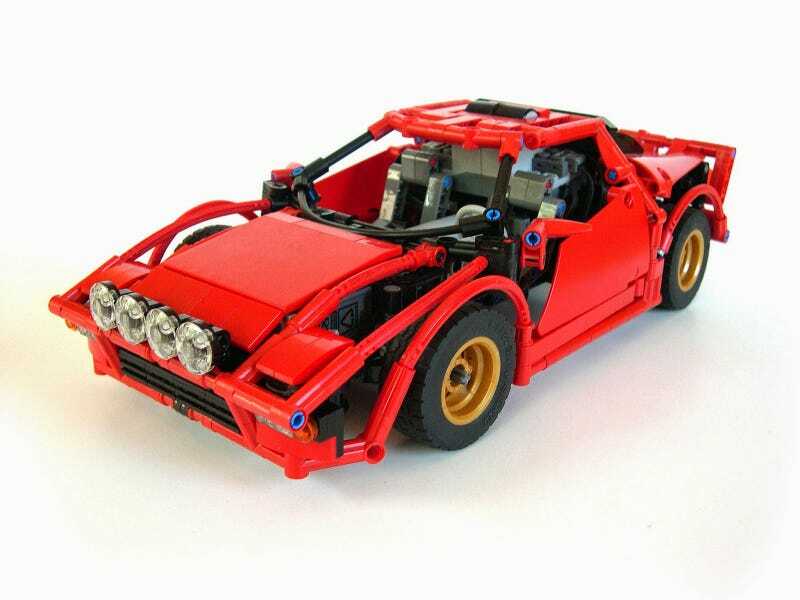 Piterx managed to evoke both the Stratos's curvy arcs and its wedge-shaped profile using nothing but off-the-shelf Lego parts. And with dual RC motors, this thing moves. Even the dynamics are accurate: Piterx put one of the two batteries powering the car way up front under the hood for better weight distribution. "The result is an overpowered car which drifts as soon as you touch the throttle," Piterx explains. "It's been quite a pain hiding it under the hood but I think it came out quite elegant." Head over to Piterx's blog to ogle the full collection of custom-built R/C-powered Lego vehicles. They'll make you want to drop whatever you're doing and spend the rest of the day playing with Lego.